We, Paramount Pest Control, have been providing Commercial, Industrial & Residential pest control services around the country regions. 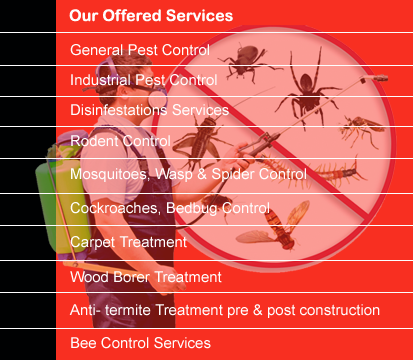 Paramount Pest Control was promoted and established in Rampur, U.P. in the year 2000. We are one of the leading pest control organization that are Government registered, Licensed from concerning authority and are member of Pest management Association. Owing to our total quality proven services, we are accredited with ISO 9001: 2015 certification. We render our services to our clients based in UP, UK, Delhi, NCR & MP. Today PPC has on its clientele a large number of esteemed companies and corporate of repute and has consolidated the position in the market. As well as Pharmaceuticals, Food, Garments & Auto Industries, Universities, Hospitals, Medical collages, School, Banks, Warehouses, Hostels, Hotels, Restaurants, Residential and Commercial premises. PPC is known as an organization who offers quality pest management services for treating all kinds of pest infestations in a very effective and efficient manner and providing 100% satisfactory result since last 17 years.